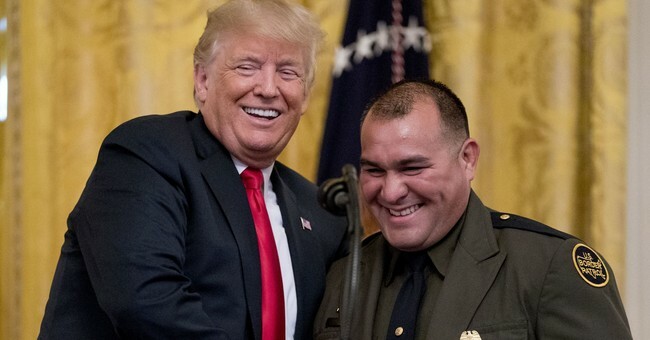 During a ‘Salute to the Heroes’ event Monday at the White House honoring the men and women of the U.S. Immigration and Customs Enforcement (ICE) and the Customs and Border Protection (CBP), President Donald Trump said strong borders are key to the nation’s strength. “For America to be a strong nation, we must have strong borders,” he commented. According to a fact sheet posted by the White House on Monday, if the government were to abolish both institutions, that could potentially mean the loss of safety for its citizens. “Those calling to abolish ICE should justify their position to the 518 human trafficking victims and 904 child exploitation victims rescued or identified by ICE HSI in FY 2017 alone,” the fact sheet reads. During his speech Monday, Trump also likened a blue wave in the midterm elections to a potential crime wave. “We will never surrender our nation to the forces of anarchy and chaos and crime. We will not allow our communities to be consumed by deadly poisons and violent predators,” the president said. “The poisons are flowing across our border and we’re hitting it from every angle, but we need new laws. We need border laws, we need immigration laws, we need them fast, we’re going to get them,” he concluded. “Moreover, abolishing it would only take us back to 2003, when the agency was first formed,” writes Sean McElwee. “Though the party has moved left on core issues from reproductive rights to single-payer health care, it’s time for progressives to put forward a demand that deportation be taken not as the norm but rather as a disturbing indicator of authoritarianism,” he concluded.